Shoot Many Robots, developed by Demiurge Studios and published by Ubisoft, is the first in-house project from Demiurge. Demiurge has a history of being the go-to studio to help out with memory optimization and porting. Their biggest project was the port of Mass Effect from Xbox 360 to PC. With the title Shoot Many Robots, the player is going to expect the game to deliver one thing above all else, gobs and heaps and tons of robots to decimate with projectile weapons. That is the easy part and I will cheat and go ahead and spoil that Demiurge supplies the robots and the projectile based weaponry, but does Demiurge, in their first original outing, supply the special sauce known as awesome and fun with their main course of robots? 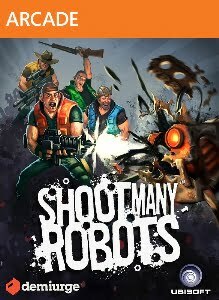 Shoot Many Robots is a 2.5D side-scrolling shooter in the vain of Metal Slug and Contra. You play as P. Walter Tugnut with the P standing for Pickles. Good old Pickles is your typical hick stereotype that seems popular in titles based in the wastelands. Most of the in-game jokes and style stem from Pickles being a survivalist hillbilly that stockpiled guns, ammo, and beer in his truck-house a.k.a RV preparing for the Robot Apocalypse. After robots destroy his truck and his house, he is able to save his truck-house and departs on a mission of robot slaughter in hoping to save humanity. In fact when you first start the game, you end up going through a tutorial that pits you through this traumatizing event for Mr. Tugnut. The irritating part is that there is no menu or anything at the beginning. You are dropped right into playing. After completing the beginning you can continue on to the maps section to choose a level or pause and go to the main menu where options and multiplayer features are hidden. Pickles has special moves outside of just shooting robots. He has a jet pack to hover over the hordes and can punch red rockets and send them back ala “return to sender”. There is also a ground pound maneuver and a wicked rocker/baseball slide. The rest of the gameplay consists of looking left or right and shooting. To aim, pull the left trigger and watch as Pickles can now aim but not move. Somehow one has to wonder if twin stick shooting would have worked better here instead of the Resident Evil style. If Pickles is damaged, he falls back and drinks an ice-cold beer to refill his health. There are also power-ups that are dropped from dead robots including melee damage increase, speed increase, critical chance increase, secondary ammo refill, and health refill. There is a RPG-style customization engine with a plethora of gear and weapons to unlock. These unlocks aren’t just visual but they have stats and allow the player to build their redneck their own way. There is a wide variety of gun types to use ranging from assault rifles to sub-machine guns to rocket launchers to joke weapons like gnome launchers and freeze rays. Experience and levels are also gained from killing robots giving Mr. Tugnut increased health and damage along with access to more advanced gear. Robots drop nuts and these nuts are used to buy gear. Constant killing raises Pickle’s combo meter creating a multiplier that increases the sweet sweet nuts that he receives. And constant killing is what Pickles will be doing. Pickles will constantly be killing in recycled stages that follow two styles of either side scrolling missions or survival style arenas. These levels are filled with almost unchanging masses of the same robots over and over again. The campaign on normal takes around six hours and has two more difficulties to play through. The big feature of Shoot Many Robots outside of many robots is that it is a co-op title and is meant to be played that way. Locally there are two P. Walter Tugnuts running around and if you take the game on Xbox Live, there can be up to 4 Pickles slaughtering the robot masses. Four players means more nuts, explosions, power-ups, and robots. Also co-op severely lowers the difficulty of the game because if you run out of beer and drop, you can be revived by your co-op mates meaning that as long as one of you are alive, the game continues. Players are given a rating on the level out of five stars and the nuts collected in the game are split among players based on their placing among each other. Unfortunately co-op doesn’t remedy the repetition in levels and robots. In fact there are more robots that take longer to take down which may increase the level of boredom for some. It bothers me to have to rate Shoot Many Robots so low. The game held great promise as Demiurge created an aesthetic that was extremely likeable. Unfortunately repetition and certain design choices in the gun play drag this game down from a must buy to wait until it is one sale. Not everyone will survive. An ancient alien race, known only as “Reapers,” has launched an all-out invasion leaving nothing but a trail of destruction in their wake. Earth has been taken, the galaxy is on the verge of total annihilation, and you are the only one who can stop them. The price of failure is extinction. You are Commander Shepard, a character that you can forge in your own image. You determine how events will play out, which planets to explore, and whom to form alliances with as you rally a force to eliminate the Reaper threat once and for all. How you wage this war is completely up to you: go into combat with guns blazing or use cover to plan a more tactical assault. Utilize your squad to full effect or take a lone wolf approach. Rain death from a distance or go toe-to-toe with enemies using devastating melee attacks. Mass Effect 3 will react to each decision you make as you play through a truly unique experience of your own creation.